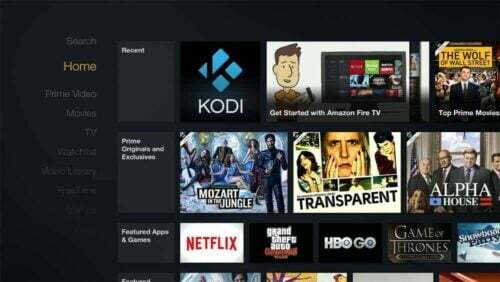 Launching Kodi on Amazon Fire TV and Stick can be tedious, so in this post I will show you how to simplify this task by creating a Kodi shortcut on Amazon Fire TV home screen. In my recent post, I compared Amazon Fire TV with Raspberry Pi for running Kodi media center. Amazon Fire TV performed way better than Raspberry Pi. Then, I showed you how to install Kodi on Amazon Fire TV. Unfortunately, Amazon Fire TV does not allow or create icons on homescreen for sideloaded apps. Therefore, the only way to launch Kodi is go to Settings -> Applications -> Manage All Installed Applications -> Kodi -> Launch Application. That's a lot of clicking to launch Kodi. Fortunately there are ways to simplify this. With a workaround we can create Kodi shortcut on Amazon Fire TV home screen. Update (Dec 20, 2015): Amazon Fire TV software update (5.0.4) has allowed sideloaded apps to appear in the Apps menu. Although this makes launching Kodi or other sideloaded apps easier, I still recommend using FireStarter. Update Oct 24, 2015: On all Fire TVs and Sticks I recommend using FireStarter for launching Kodi. This guide works only on 1st-gen Fire TVs that still have Fire OS 3 (not the latest version 5). Update Oct 6, 2015: Amazon Fire TV 2015 4K version can only auto-boot to Kodi at this point (details below). There is no known method to create a working Kodi shortcut on the new Fire TV homescreen. Before you begin, ensure that Kodi is installed on Fire TV. You never know when Amazon would block Kodi, so ensure that you are blocking automatic software updates from Amazon. Update Oct 24, 2015: iKonoTV app is not needed for the new 2nd-gen or 1st-gen Fire TV 2015 with Fire OS 5 as the shortcut icon will not work. Start Kodi using FireStarter instead. This guide will not create a working Kodi shortcut. 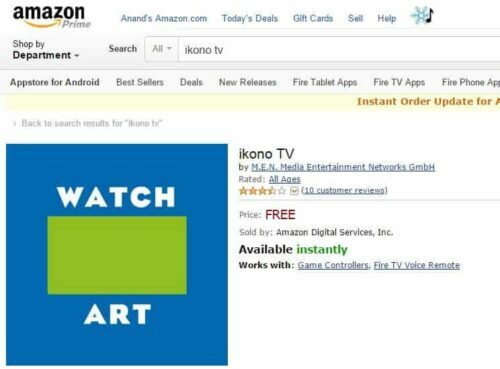 First go to Amazon App Store, search for ikono TV App, and install it on your Amazon Fire TV. Llama app automation rules (Step 2) will automatically launch Kodi every time iKonoTV is launched. Update Oct 24, 2015: If you have the 1st gen Fire TV with Fire OS 3 (not the latest version 5) then you can download a previous version of adbFire from here. The latest version of adbFire won't work to launch Kodi with ikonoTV. If you have not already done so, download adbFire app. Extract it to a known folder. Then open and configure adbFire to setup your Fire TV. If you followed our Kodi install guide, then should already have completed these steps. If not, it is still not too late to do it now. 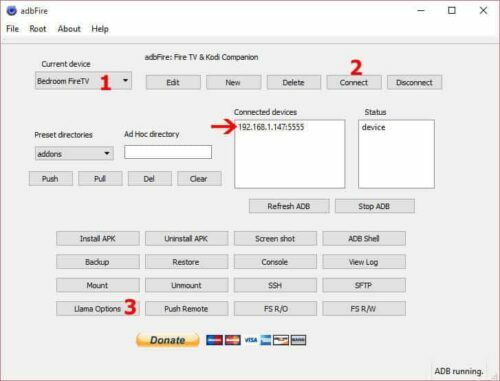 Open adbFire App, select your Fire TV profile from “Current device” list, and connect to your Fire TV. Ensure that your Fire TV's IP address is listed under “Connected devices”. Next click on “Llama Options”, as shown in the picture below. Update Oct 24, 2015: Jocala has updated the adbFire App for Fire OS 5, which does not allow launching Kodi with iKonoTV. In place of “Llama Options” icon you will find “FireStarter”. Use the “FireStarter” button to install FireStarter or follow my FireStarter installation guide. FireStarter makes launching Kodi easy. A separate window will popup after click “Llama Options”. Next follow the steps below to create Fire TV Kodi shortcut icon. 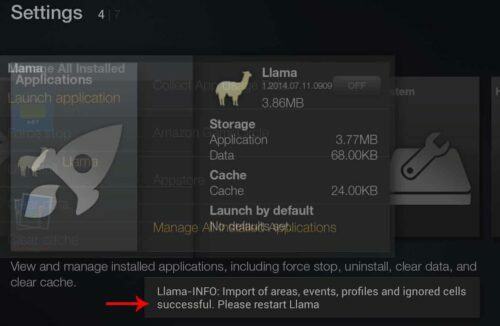 If you do not have Llama app installed on your Fire TV then check the box to install it. When in doubt just check the box (no harm in reinstalling Llama). Ensure “Kodi” is selected as the Media Center. Choose “Link Media Center to Program”. You may choose “Both” if you want Kodi icon on homescreen as well as want your Fire TV to automatically start Kodi upon booting (useful when using Fire TV only for Kodi and nothing else). On the new Amazon Fire TV 4K, Kodi shortcut on homescreen will be created. But clicking on the icon will only open iKonoTV and not Kodi. There is no known fix for this at this point. You will have to open Kodi from Settings -> Applications -> Manage All Installed Applications. However, you can make Fire TV automatically start Kodi upon booting. To do this, select “Both” instead of “Link Media Center to Program” in above steps. Llama app, if you do not know, is an awesome app that automates a lot of things. In this case, we are going setup some rules in Llama that will create Fire TV kodi shortcut on homescreen. Let adbFire do its thing and proceed to completion. You will see a confirmation message like the one below. You are not done yet. Yes, your Kodi shortcut icon is created on homescreen but it won't work yet. Click on the Llama settings icon on the lower left corner and then select “Import/Export Data”. Next, choose “Import from USB Storage” and click “YES” to confirm import. Upon successful import, you will see confirmation message on the screen. In essence, what Llama does is, when ikonoTV is opened Llama kills it and opens Kodi instead. This happens in the background and many times you may not even see ikonoTV being opened. And by replacing ikonoTV icon with Kodi icon using the adbFire app, you add another layer of disguise. If for whatever reason the kodi shortcut on Amazon Fire TV throws and error or does not open Kodi then the most likely reason is incorrect Llama event rules. Below is a screenshot of mine (yours may look slightly different). Each line is an instruction to AFTV to make it do something when something else happens. Make sure yours says “Kodi” instead of “XBMC” in all the rules. If certain rules don't exist you can manually create them yourself. I find it easy to do these things with Amazon Fire TV remote app on my Android tablet, as it makes typing easier. Every time the iKono TV app updates from the App Store, its icon may be restored. So every once in a while you will lose the Kodi icon. Just rerun the adbFire utility's Llama Options with only the “Replace Program icon” option selected. Once again, on the new Fire TV UHD released in 2015, only booting to Kodi media center works. Homescreen short cut to open Kodi does not work at this point. I may have a separate guide on this, but if you want your Fire TV to boot to Kodi automatically then just choose “Both” under Llama Events on the adbFire app. So there you go, create Kodi shortcut on Amazon Fire TV home screen and simplify launching Kodi media center.